For fuel flow up to 114 LPH. Amazing value for a limited time ! Dirty fuel is becoming an increasingly widespread problem with common rail diesel engines. Any moisture or contaminants allowed to pass through into the fuel system can potentially damage injectors, pumps and other expensive components, and with injectors costing up to $8,000 per set to replace, the price of repairing this damage can quickly become expensive. The Filter consists of a 3 ,10 OR 30 (DEPENDING ON MODEL) micron diesel pre-fuel filter designed to eliminate expensive engine damage by reducing fuel contaminants that could potentially cause blockages if allowed to pass through to most common rail diesel engines. Is easily fitted to any common rail engine as a primary filter to clean dirty fuel before it reaches the system components, and acts as an agglomerator, causing moisture to form droplets of water and collect into a Perspex drain bowl before it has the opportunity to become hazardous. The Perspex bowl allows the filter to function effectively while avoiding damage that can occur in glass by elements such as frost and stones. Warning! Do not smoke, allow open flame, or heat near installation which could create a fire. Perform installation in a well ventilated area. Refer to installation diagram and keep these few guidelines in mind while installing the filter assembly. 1. Apply thread sealant to tapered threads of inlet and outlet fittings prior to installing into mounting head ports. 2. Install filter underhood for protection against extreme cold temperatures. This will help in preventing fuel gelling. 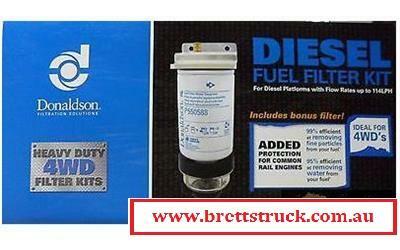 Diesel fuel additives containing alcohol can damage non-metal components in fuel systems and are not recommended. 3. Ensure that fuel lines are secured to protect them from rubbing on other surfaces. Avoid tight bends and high heat sources. 1. Spin bowl and filter (together) off mounting head and fill with clean fuel. 2. Spin bowl and filter (together) onto head and tighten firmly by hand. 3. Start engine and check for leaks. Correct as necessary with engine off. Water is heavier than fuel and will settle to bottom of bowl. In high humidity environments, check collection bowl frequently (daily if poor fuel source is suspected). Element Replacement frequency is determined by the contamination level in fuels. 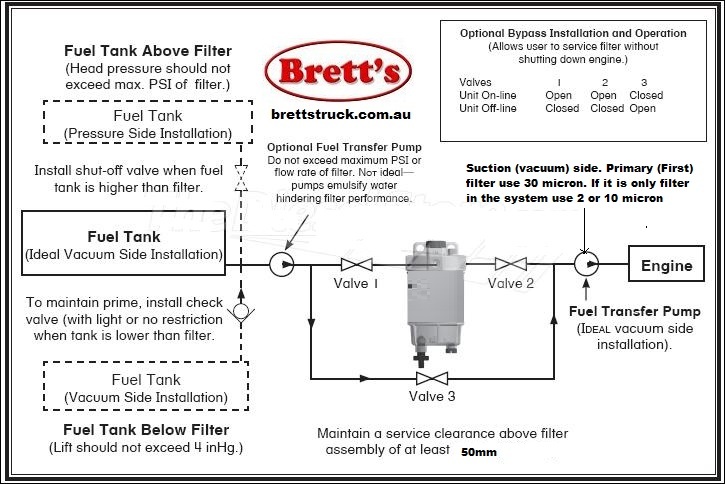 Fuel flow to the engine becomes restricted as the element gradually plugs with contaminants, resulting in noticeable power loss and/or hard starting. When any one of these occur, change the element as soon as possible. As a guideline, change the element every 500 hours, 10,000 miles, every other oil change, annually or at the first indication of power loss, whichever comes first. 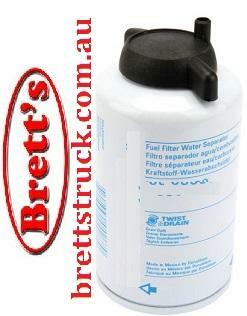 Always carry extra replacement filters as one thankful of excessively contaminated fuel can plug a filter.